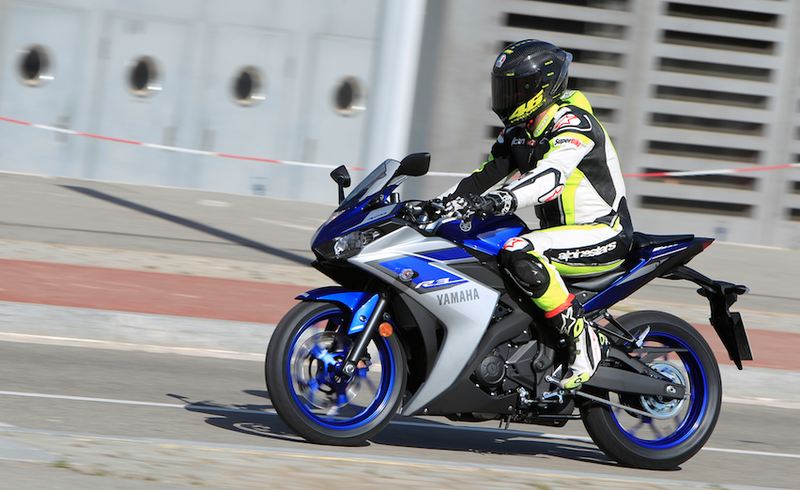 Yamaha R3 – First Ride. Fifteen years ago I was 20 years old. Reef provided the soundtrack to my life and 400cc supersport bikes were miniature mounds of beauty. I’m not old enough to remember the 350LC craze the first time around. No, for me and any of you currently between the age of 32 and 40, an RGV250 or a 400cc screamer was where it was at. For that reason, I ignored my head and bought an explosive Gilera Nordwest. Handily, my partner in crime at the time bought himself a Yamaha FZR400R. For two years we rode without a license. Being in the Army and posted to an old RAF camp meant we had access to an MOD airfield perimeter road. I’ve spent a fair amount of time riding, chasing or being chased by Yamaha’s lightweight four-stroke screamer. 400cc sports bikes are still popular, but they’re not quite as plentiful as they used to be. £1500 quid would bag you a beauty back then, you’d be lucky to find a clean one for less than three grand now. Ah well. In the fifteen years between now and back then, 600 supersports bikes have also pretty much died a death. The economic downturn didn’t help, rising cramp meant that if you were in the market for a brand new 600, you were also in the market for a year old litre bike and we all know which we would really rather have. Consequently the 400cc sports bike feeder market stalled and has now become some kind of retro sports bike corner of bike meets. We all look and poke and reminisce every time we spot a baby Blade or a Smokin Joe VFR400, but chances are the guy with the keys in his pocket is old enough to be your dad. 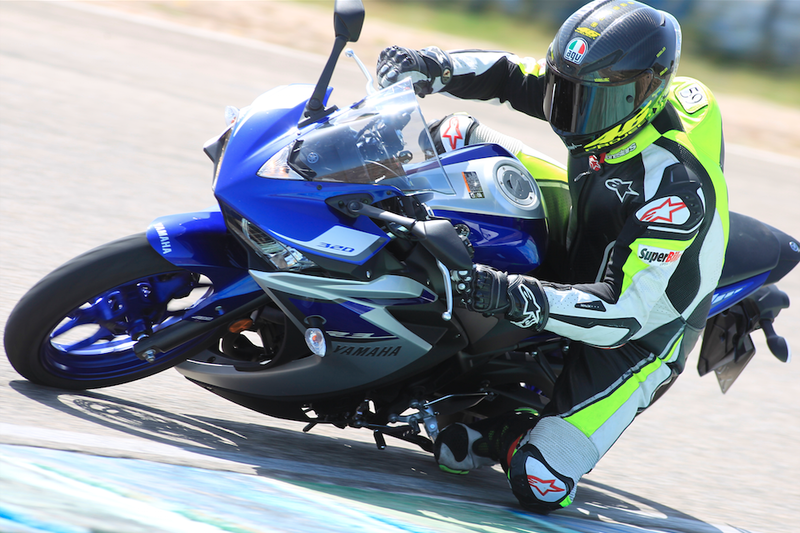 There has been a bit of resurgence in the small capacity sports bike category. 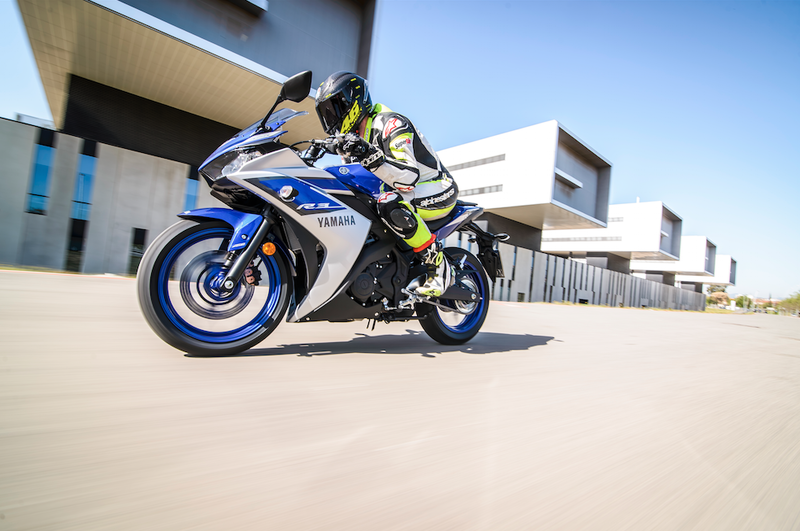 Kawasaki, KTM and Honda all have their hat in the ring, but it’s the YZF-R125 that has consistently outsold the lot of them. Scores of scrotes are on them, flying through towns safe in the knowledge that they’re riding one of the best selling bikes that Yamaha has built in years. Handily for that massive market of 125 owners in the UK, the Government has made it as hard as possible to step up in terms of power and pace. Most 125 owners are chopping their bikes in for Renault Clios come refinance time. 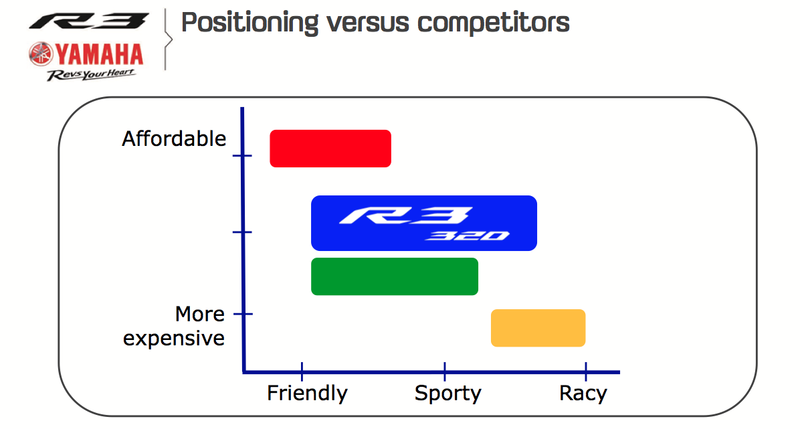 Yamaha aren’t giving up on all their hard work and for 2015, they’re adding the R3 to its Supersport range. Bridging the performance and financial chasm between 125 and R6, the R3 is an A2 license friendly supersport bike that could be just the ticket for retaining some of the hard-to-find youth percentile of our riding market. With big brother looks but kid brother manners, the R3 looks the part if you were to brush past one in a multistory car park. The bike was pitched to us as a do it all bike. One that commutes as well as its scratches as well as it could tour cross-country. On paper at least, it struck me that maybe Yamaha are trying to cover one too many bases with the marketing steamroller. The everyday reality of course, is that this kind of do it all nature is a modern day necessity, regardless of capacity. So, what do you get for your money? You get a 321cc parallel twin, which produces 42bhp at 10,750rpm. Slung in a steel diamond type chassis with 41mm KYB forks at one end and a KYB monoshock at the other. 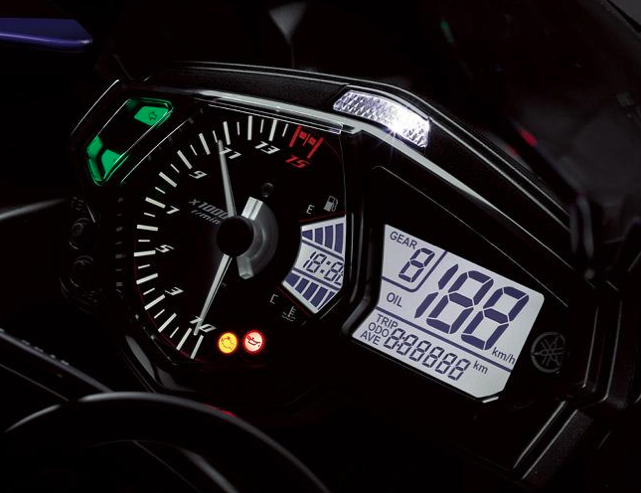 The Yamaha R3 tips the scales at just 169kilos ready to ride, twenty less than an R6 but ten and a bit more than the KTM RC390, the bike feels slinky and incredibly easy to manage on the move. Though the forks are unadjustable, the shock has preload adjust, you’ll get on just fine with the suspension, I certainly had no major complaints after a full day on the road and track. I also no doubt weigh much more than the target customer, so don’t feel like you’ve been short changed because you can’t tweak the springs. The friendly seat height of 780mm means you’ll never struggle to balance the thing on your foot at lights, the low weight means you’ll never struggle to push and pull the thing round getting it in and out of the garage or a tight parking spot. You get gears, six of them no less. Perfectly matched and with only one neutral in exactly the right place, the transmission felt perfectly matched to the power and torque that the sweet little motor made. You also get brakes, single discs at both ends are ABS controlled and up to all but the very last few late braking lunges that I could throw at them around Calafat circuits’ twisting turns. Michelin tyres wrap pretty looking ten-spoke wheels, the rear of which sits in a swingarm that’s the same length as the previous model R1. It’s a compact package that appeals in real life much more than it does on paper. Bimbling through Spain, the Yamaha R3 displayed all of the manners and nimbilty (I made that word up, but I think it fits what I’m getting at) that you would want if you were in the market for a town based commuter bike. I loved the willing motor, it fuels cleanly and had a useable pocket of power at the top end, perfect for nudging away from cars at the lights and for firing off unknown mini roundabouts. The mirrors highlighted two things. The first is that the mirrors are very good (not an easy task for every manufacturer, it would seem) the second was that the bike looks ace when you spot them in your mirrors. It reminded me of an early model R6. If the 1999 R6 were released in 2015, it’d look a lot like this bike, if you get what I mean. It’s definitely part of the Yamaha supersport family and will no doubt become as instantly recognizable as the 125 is at the minute. The clock set is simple but functional, the shift light will catch your attention, but not every time. You’re best off using your ears and a dash of mechanical sympathy to judge when the time is right to make a shift. Out of town and onto some faster A roads, we quite quickly settled into an easy pace that you’d have to flog an R125 to death to keep up with. This is certainly not an all show no go kind of bike, sure you have to remember that it has a small capacity engine, but it’s not so small that I wouldn’t be happy riding it on big mileage trips. In one dusty layby I lit a smoke and commented that I’d be more than happy to ride the bike home to blighty from our Spanish coastal route, had I been allowed to do so, I wouldn’t have been alone as the rest of the group seemed to agree. What I’m waffling at is the fact that this bike will cruise at 75-80mph without making you feel like you’re punishing the pistons for hours on end. Carburised conrods, the offset cylinders and 180° crankshaft all contribute to the unstressed nature of the motor. Grabbing a coffee after a spirited blast through a valley with the kind of road that British riders dream of, I found myself quite happy to sit and admire the little Yam. Lesser men would be embarrassed to be seen on a little bike, lesser men would have also struggled to keep up ten minutes before on the sweet road we’d just ambushed. R3 felt as confident on the fast twisty route as it felt competent in town. Maybe the marketing spaff about being a do it all bike wasn’t so misplaced after all. On the fast final squirt to the circuit, I topped 100mph. Given time and some more commitment I think it’s entirely feasible that this bike could do 115mph, even with my bulky mass on board. The road ride highlighted the well-mannered nature in town, the comfortable riding position and useable range of power at everything up to and over the national speed limit. The looks department gets a healthy tick as well, it may not matter to you, but it certainly matters to a fair chunk of the R125 riders that’ll be pushing nose to glass at this bike in showrooms. Though some of the controls looked a little bit budget (that rear brake lever in particular), I was also happy with the fit and finish of everything that I touched. All that remained of the day was a run out on track. Handily, the night before we sat and watched the COTA Moto3 race on a huge screen in the hotel lobby. The little R3 was about to get a bit of a thrashing. It coped really well, there’s something about a fleet of low powered bikes all being on track at the same time that usually results in carnage. Within a couple of laps I’d been dropped by the quicker riders and had gapped those that were slower than me. I settled into a rhythm that was fun without being too physical or dangerous. Towards the end of each session the brakes started to show some signs of weakness and I didn’t have masses of confidence in the bike when it was cranked all the way over. I did have stacks of fun though and not once did it feel like the bike wasn’t willing to get stuck in. Each session finished with big smiles, zero arm pump and not an out of breath rider in sight. It’s a fun bike to ride on track for sure. Track day novices would feel like they’re getting their money’s worth, track day regulars would feel like they’re a bit of a hero. 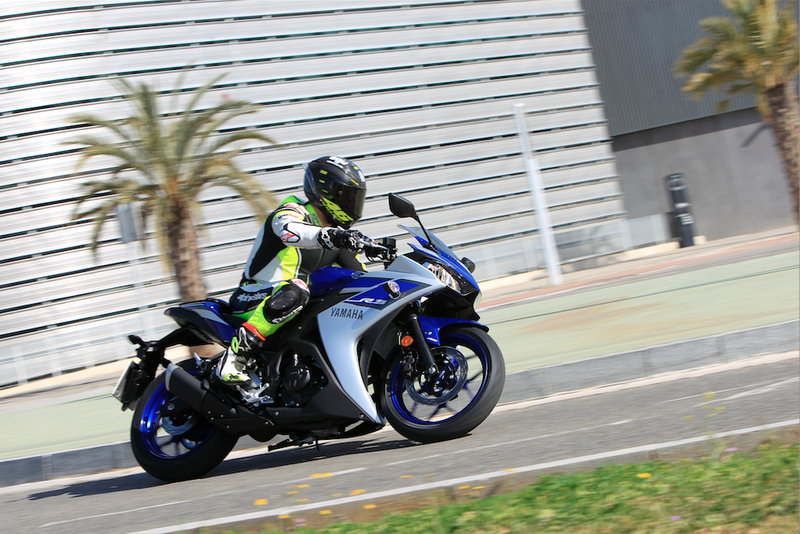 What more do you want from a performance orientated Yamaha? The bike costs £4799. It’s not an inconsiderable amount of money to slap down, but the PCP deal that Yamaha are offering makes this an appealing bike to existing R125 owners. It’s only a tenner a month more at £79 than the little 125. That’s eight packets of cigarettes a month, or less than a 1-4 Oyster card. The Yamaha R3 deserves every ounce of the sales success that the 125 has had, if you’re in the market for a commuter bike that’ll paint a smile on your face like no large capacity scooter ever could, you could do a lot worse than heading to your nearest dealer and kicking the tyres on one of these. 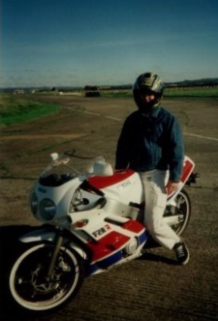 The only picture I have of me on my pal’s FZR400. Yes, that it is a denim jacket.